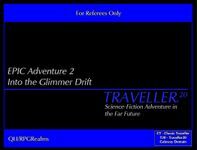 Into the Glimmer Drift is a Traveller adventure set in the Domain of Gateway. It is designed specifically for use with both Classic Traveller and the Traveller20 rulesets. In addition to a complete adventure, this booklet also contains details on the Kraxin and Williamsburg subsectors within the Glimmerdrift Reaches sector, a complete set of deckplans and statistics on the Type-S Scout/Courier starship as well as a Ramada Class Corvette. You will also find statistics for an 8000-ton Light Cruiser, a 2000-ton freightliner, a 5000-ton Trade Cruiser, and an 800-ton Long-Range Trader.